One distinction for those who are ordering these online, the dishes are darker blue than the pictures show – which was fine with me since I prefer the darker color anyway. I also did the Ship to Store method and was pleasantly surprised at how easy it all was. I even had a young man offer to help me take the large, heavy boxes out to my car. Overall, GREAT experience and I’m thoroughly in love with this produce. I HIGHLY recommend! Have you heard about Earth Hour? I just recently stumbled across the idea and have to admit that I’m very intrigued by the whole concept. It basically asks that everyone turn off their lights and any other non-essential electronics between the time of 8-9 pm in whatever time zone you live in. The idea is that we would all reduce our carbon footprint simultaneously and have a greater positive impact on the environment. Here’s a great before and after pic of Sydney, Australia (where it all started last year) and the article I read that started it all for me (click on the pic to get there). Earth Hour’s website has a list of suggestions of what to do for that hour in the dark. Of course, the best suggestion I heard was to get outside and SEE the stars. Especially in cities where a lot of people and companies are participating, you might ACTUALLY be able to see the glow of the Milky Way, or at least a few stars here and there. 🙂 In fact, there’s even an movement called, National Dark-Sky Week, that says that 90 percent or more of all Americans younger than 18 have never seen the glow of the Milky Way galaxy with their own eyes! Whatever you decide to do, it’s a great opportunity to discuss environmental issues with your kiddos and to just do something ‘out of the norm’ for some family time. Have a Happy Earth Hour!! I went to Target yesterday with intent of buying my dishes â€“ you know, the ones that I wanted, not the ones that KATE wanted… 🙂 I get there only to discover theyâ€™ve cleared out the Global Bazaar section and are bringing in patio furniture and Easter stuff in that section of the store now. Great. So, donâ€™t panic, just go look where all the other plates are. Do they still have the ones that I want? No. Of course not. So, I go home dejected. Again. Shawn mentions the possibility of buying them online. Hope reborn! I go online and… sadly, they are â€˜not availableâ€™ anymore and the serving dishes that match are on clearance. Boo. Sad again. 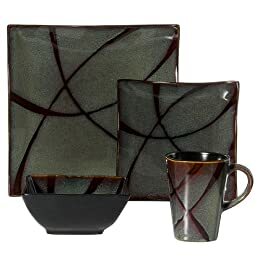 Since most of my â€˜dishes moneyâ€™ is cash, I decided to widen the search to ALL dinnerware Target and otherwise. After much searching on many sites including IKEA, Linens-n-things, other major department stores, etc and still not finding the â€˜rightâ€™ ones that called my name, I went to Walmart.com expecting NOTHING of course. It IS Walmart after all. What kind of good quality, trendy dishes are going to be at Walmart? I canâ€™t wait to go to Walmart and check them out in person. And maybe even BRING THEM HOME!